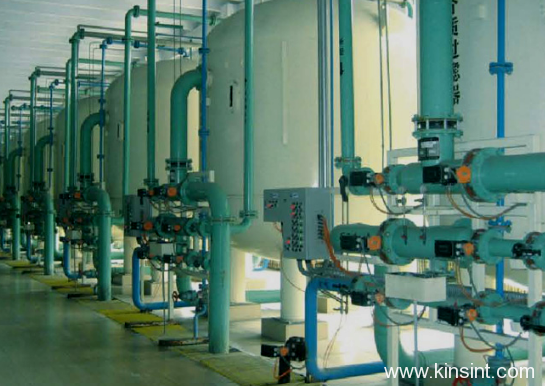 Multi-media filter - Xi'an Xinshengtai Water Treatment Technology Co., Ltd. The filter material of multi-media filter can be made of manganese sand, anthracite, silica sand and gravel. Filter material of active carbon filter mainly made of active carbon, and silica sand and gravel as bedding. Two different of control methods of manual and automatic could be transferred. Auto control system will monitor and control all operation stations and technology control points, no need workers to watch over. 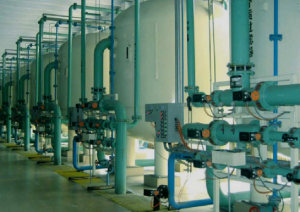 System uses air and water backwashing to backwash and discharge, and also improved utilization rate of water by using concentrated water of RO system for backwashing. It will realize automatic backwashing by stated time on upper computer or set value of outlet pressure difference during filter backwashing process. Operation models of filter include yield water, water backwashing, air backwashing, conventional washing etc, all operation models should be automatically operated according to setted programs. 1.Multi-media filter can effectively eliminate suspended solids and alga and more organics in raw water, and lower turbidity of raw water. 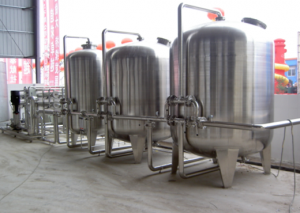 2.Active carbon filter can effectively eliminate colloid and oxide in raw water.